Our Doune Florists are incredibly hard working and passionate when it comes to flowers and with over forty years of expertise under their belts, it’s safe to say that they know a thing or two when it comes to arranging your bouquets. Not only are they incredibly talented but our Doune Florists are also friendly and want to help our customers as much as possible when it comes to your flowers so your order with us is as fuss free as it can possibly be. You can have a browse through our website to see if what our Doune Florists have already arranged fit your special occasion but if not, then don’t worry as we offer our customer the bespoke service. Through the bespoke service, our customers can work in collaboration with our Doune Florists to create the perfect bouquet for your recipient as you can tell us exactly what you want your bouquet to look like. The flowers our Doune Florists work with are all diverse and differ in colour, shape and size which is how we are able to cater for such an extensive amount of occasions – all the way from weddings to anniversaries to birthdays and new born baby events and so on. Our Doune Florists use their artistic flare to lace together flowers such as anthuriums, calla lilies, roses, orchids as well as many others with a bed of lush greenery, using leaves such as eucalyptus and pittos in order to create a contrast and highlight the beauty of our flowers. Once the body of the bouquet has been arranged, our Doune Florists artistically top off all bouquets with vibrant yet simple papers, tissues and ribbons to complement your flowers. All the flowers our Doune Florists work with have been cultivated and then directly imported to us all the way from our suppliers in Holland and with up to four deliveries per week, not only are our flowers the definition of premium quality but they are also the freshest. This means your recipient will be able to enjoy their flowers for many days to come. Our Doune Florists strive to provide our customers with the most beautiful bouquets possible. Once your order has been compiled by our talented and efficient Doune Florists, our customers have the choice to use one of our several delivery services. We offer our customers our delivery service which runs weekly every Monday to Saturday, our next day delivery service as well as our same day delivery service. Our same day delivery service is particularly handy for those occasions that have cropped up suddenly or for those who are more prone at forgetting things as you are able to place your order and have it delivered on the same day. 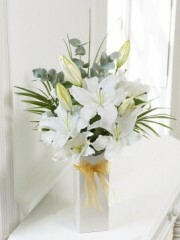 This means that your flower order is arranged on the day of delivery which is why you must place your order before 3PM. This is in order to give our Doune Florists enough time to organise everything for you. Distance is also not a problem for us as we are part of the Interflora delivery network which means we are able to deliver not only locally but nationwide to all the far corners of the UK as well as abroad to over 140 different countries worldwide so no matter where your recipient resides, your flowers will be delivered to your desired location in an immaculate state. 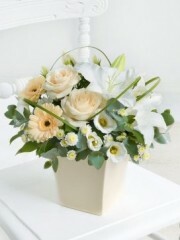 Additionally, our Doune Florists can arrange for a gift to accompany your flowers if you so wish it. We have a universal gifts selection which includes a selection of wines and champagnes; fruit baskets; mouth-watering chocolates; adorable teddy bears as well as balloons which our Doune Florists can arrange into a lovely balloon bouquet, fitting for your special occasion. We want our customers to know that you are our first priority so we can modestly say that our Doune Florists have and will continue to provide you with the best service we can.